I read an article recently that’s a prime example of what clients ask about and what I’m seeing in trading activity. How to invest for the age of Trump from the Los Angeles Times presented special considerations for financial advisors (such as myself) and it stated that bonds are the biggest worry. But it’s focus was too much on short-term headline risks rather than fundamentals and long-term trends. Have you been told “everything in moderation”. This applies to investing too. I agree with fan-fave Jim Cramer’s message to take some profits off the table after you’ve made big gains and use those earnings to find other opportunities. Freaking out over every little headline will drive you insane and possibly broke. Remember, headline risks are important to institutional day traders, but not so much investors. An investor uses short-term volatility to increase long-term potential, for instance, Trump’s tweet criticizing Lockheed Martin’s pricing of Air Force One which provided a 10% off-sale on an industry leading stock. Consider what volatility may lie ahead and use others’ fear to your advantage! Just as you should avoid putting all your money in one bucket, beware bearish calls to dump all of your holdings and flee to cash. You may not lose principal but you’ll be missing out on opportunity. Too many investors have missed out on one of the greatest bull markets since 2009 by sitting in cash waiting to time the next big crash. Remember cash is a short-term holding place until you find the next opportunity. Bond Index still averaged +3.21% annually. Nearly a 10% higher return than what money markets made during that time, per Morningstar database. Ok Smart Guy. What’s Your Plan? A key variable to investing is determining the outlook for rates. Look to history as your guide. If you think rates are going to go higher (globally growing economy) then consider US small cap stocks and non-US stocks. Emerging Markets have generally done the best (see charts below). 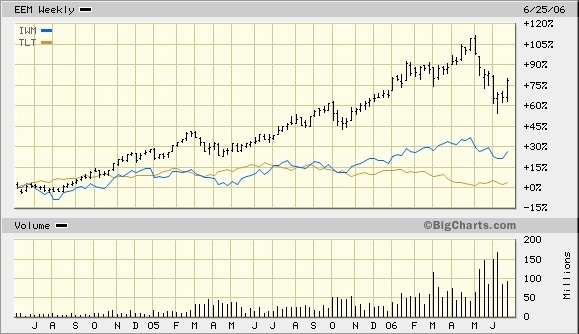 The 1st chart shows the Small Cap Index ETF (IWM) in blue, and the Emerging Markets Stock ETF (EEM) in black and the 20yr US Treasury ETF (TLT) in orange during the June 2004 through June 2006 rate rising period. 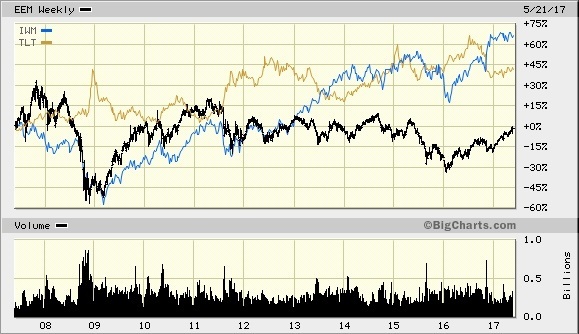 The 2nd chart shows the same ETF’s but over the past decade. In this example, riskier assets did better even when the Fed raised rates gradually and incrementally. Factoring in hyper-inflation, is a completely different matter. Lastly, if you trust rates will go lower from here (recession), then shift into Treasury Bonds and insured municipals. How High Is Your Hedge? In summary, too many people are paralyzed trying to predict the next sell-off, meanwhile the Fed and history are providing a road map for how to invest. Yet that’s not full proof – bumps in the road can happen in the short-term so a little hedging can go a long way to helping you achieve investment success. This is where a trusted advisor comes in. Do you have a built in hedge around your investments? Consider putting a 5-10% hedge in your portfolio. For example, if you’re investing for higher rates (globally growing economy) then add a hedge against that scenario in case it doesn’t work out that way. So if rates go down, you offset risk. It’s like having a driver’s-ed brake with a student driver: won’t guarantee against a crash, but sure can help avoid disaster. And remember, hedging risk is like using salt in cooking: a little goes a long way.